Among the performers, Adam Hood, Parker McCollum, Shane Smith & the Saints, William Clark Green, Jack Ingram, Bruce Robinson, and Charlie Robinson. And more. CROSBY – YEE–HAW, Let’s Rodeo! Crosby begins its annual salute to cowboy sports and County & Western Music on June 1 — Graduation Day for Crosby High School. Friday will welcome last year’s surprise success Bag Of Donuts from New Orleans for the first day of Northeast Harris County’s Biggest Party. Bag Of Donuts is going to play something everybody likes and is going to get the crowd into the performance. The next morning, the Crosby Fair & Rodeo Parade will take over Main Street at 10:00 a.m. All the while, some of the greatest cookers in the Southwest will vie for recognition, trophies and prizes in the Crosby Fair & Rodeo Cook-Off. That night another concert venue will feature Jason Cassidy and Zane Williams. Zane Williams of Abilene is a proudly authentic, down-home, good ole’ country music from the backroads to the Opry Stage. He enjoys his performance and is equal parts bar room entertainer and introspective poet. Some would call that a “throwback” to the days when a performer had to do more than just sing; many call that multi-talented. Wednesday of that following week is the Livestock Auction, where Crosby Fair & Rodeo really does its best to get the most to pay for kids to go to college. Scholarship Recipients proudly display their award certificates after Monday night’s Scholarship Banquet. Also at left if the keynote speaker, Richard Cantu assistant director of the East Aldine District and president-elect of the Aldine Education Foundation; and at right, Rotary Scholarship committee chairman Dr. Larry White. 13 of the 17 recipients were present at the ceremonies at the San Jacinto Community Center, with the others either away at college, or receiving other awards the same night. HIGHLANDS – Monday night was the Rotary Club Annual Scholarship Banquet, held at the San Jacinto Community Center. Receiving scholarships were 17 students, who attended along with their families. The scholarships totaled $30,500 and these funds were a result of the Chili Feast held each February. Scholarships were in the amount of $1500 except for four special awards named for individuals as memorials. These were $2500 apiece. The keynote speaker was Richard Cantu, a candidate for Harris County Board of Education. He is also the president-elect of the Aldine Education Foundation, which awards over $60,000 in educational support; and he is assistant executive director of the East Aldine Management District. Cantu also is a board member or affiliated with over two dozen other public service organizations, many of them supportive of educational opportunities. 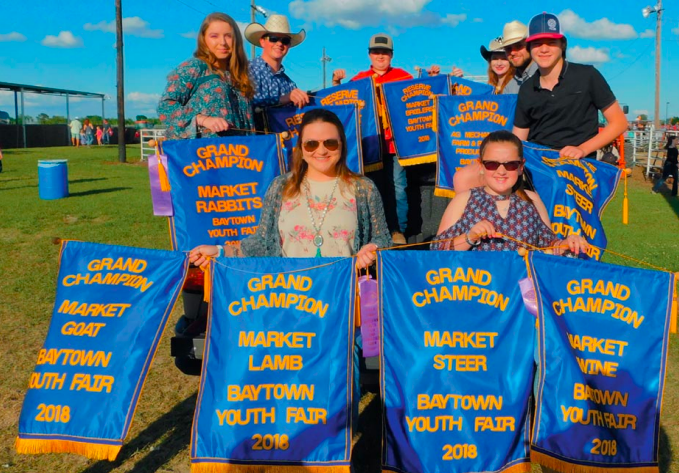 BAYTOWN – The Baytown Youth Fair & Rodeo had highlights this year for instance the Grand Champion Steer did sell for $9,000. The Steer, Teddy, weight was 1,273 and was shown by Breanna Moody, she had the Grand goat and lamb, too. This year there were 165 exhibitors in total but the auction was off some this year as it brought in about $168,000 in the year after the hurricane. Highlands resident, Tony Dahlquist presided over the show this year and got considerable input from neighboring Crosby Fair & Rodeo.